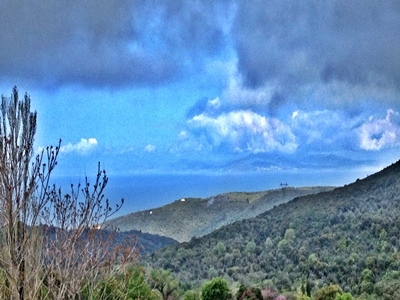 Pelion : You will never say goodbye. 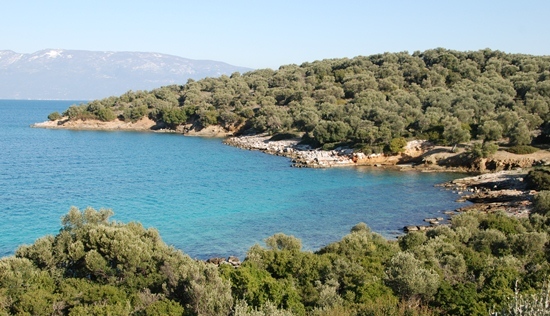 The Pelion mountain and peninsula is said to be the most magical part of the Mediterranean. 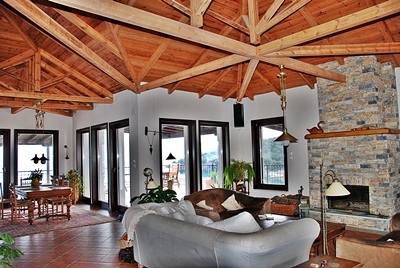 We have English speaking Web partners here in the Pelion that can help you in all aspects of property. 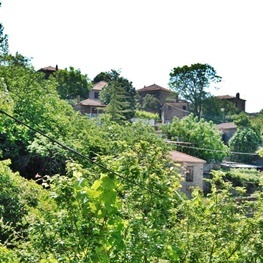 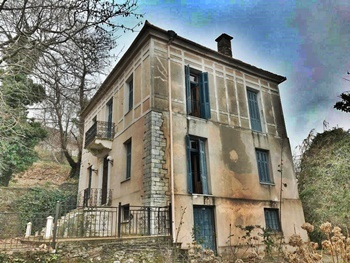 I have many more Pelion Properties : If you don't find what you want below, please E Mail me with your requirements, tell me your criteria, your budget and location and I will get back to you with some suggestions. 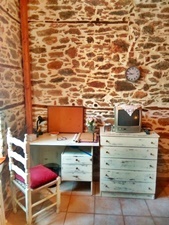 Contact E Mail Brian. 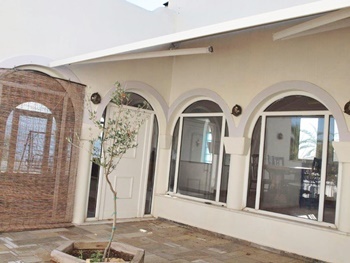 The house is a three level stone nea-classical mansion built by Greek –Egyptian merchants at the end of 1900s and has been beautifully renovated and furnished. 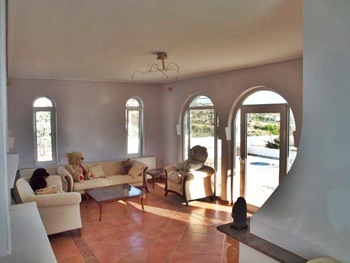 It has 2,500 m2 of fruit gardens and courts with 300 m2 of living space on 3 levels. 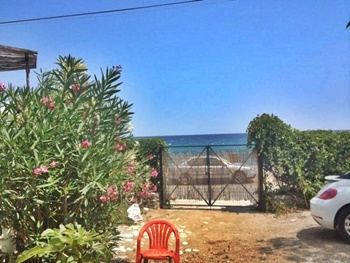 It has 5 bedrooms, living and function rooms ,kitchen, 2 bathrooms, plenty of storage with beautiful sea and Pelion costal view and is only 3 minutes walk to the impressive Mouresi square. 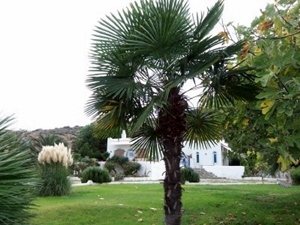 Few of these unique and aristocratic homes remain in Greece today. 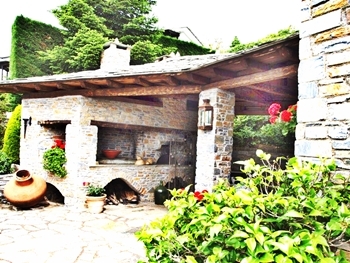 This is a prestigious mansion estate in one of Pelion’s most prestigious villages, this is an impressive stone building in a very quiet area, yet car accessed. 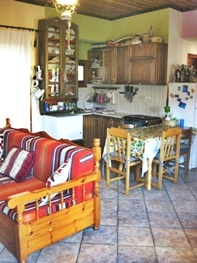 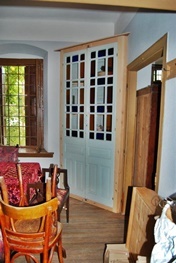 The house is surrounded by trees and nature and is furnished to cater for holiday rental guests. 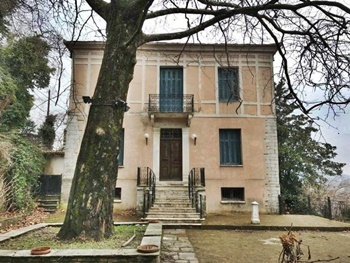 The mansion represents a remarkable marriage of tradition, aristocracy, romance and comfort with an imposing yet private presence. 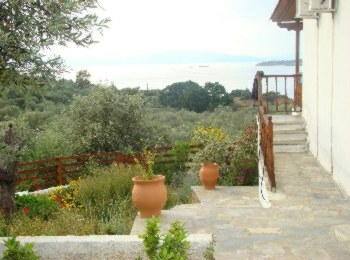 A Beautiful Villa Overlooking The Pagasitic Gulf : Aghios Athanasios : Pinakates Pilion. 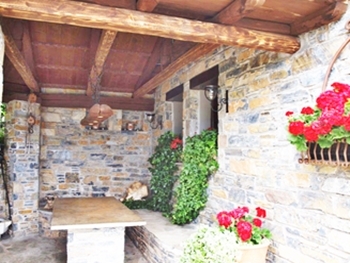 This traditional stone house is located on the Pelion hillside in the hamlet of Agios Athanasios, just below Pinakates. 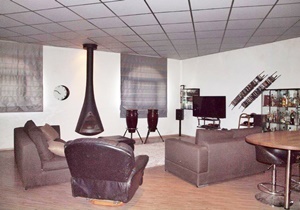 The house was fully renovated in 2009/10 (to include a new roof, electricity wiring and plumbing) and consists of 111 square meters on two floors with two annexes (bedrooms) at ground level. 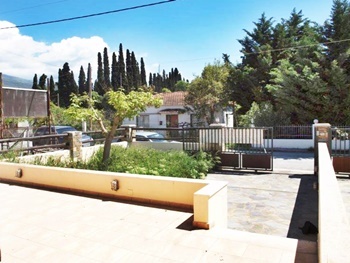 It sits on a parcel of land of 838 square meters which includes a stone patio at the front and an Olive grove at the rear with some 20 trees. 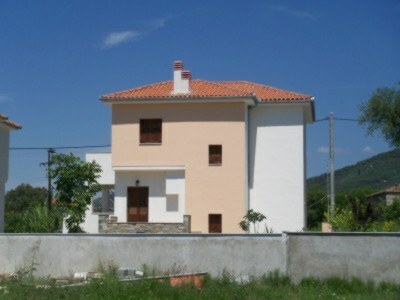 The house can comfortably sleep 4 adults and 4 children. 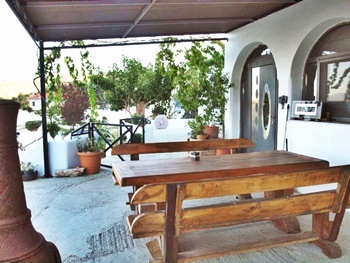 On the top floor there is an open plan kitchen/ dining /living room which opens onto an external veranda/ sitting area. 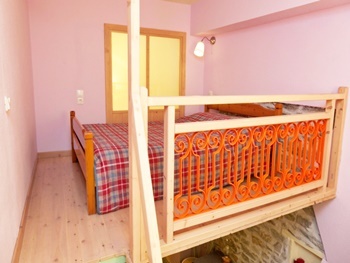 The ground floor has a small hallway, a bathroom and 2 bedrooms currently equipped with bunk beds. 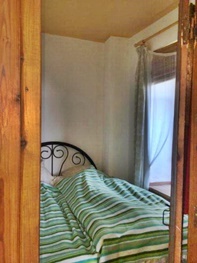 The larger room has a large built-in wardrobe. 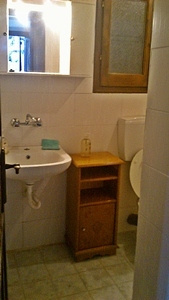 The two annexes to the main house on the ground floor comprise double bedrooms, the larger of which has an ensuite bathroom. 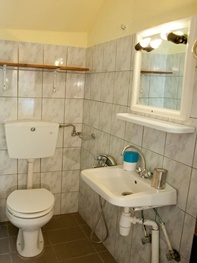 There is also an external WC located in the interior of the external steps to the top floor. 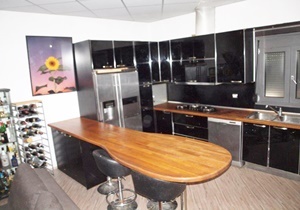 Included in the sale are the beds, sofas and the kitchen white goods and large appliances. 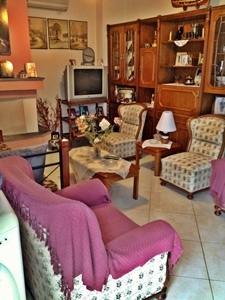 The sale of some furniture will be subject to separate negotiation. 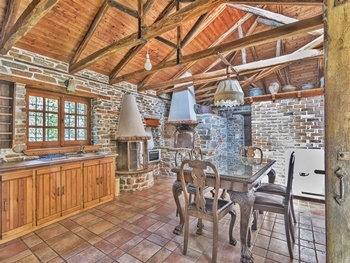 This traditional stone house and estate is ideally located at the forest side of Milies Mountain Village. 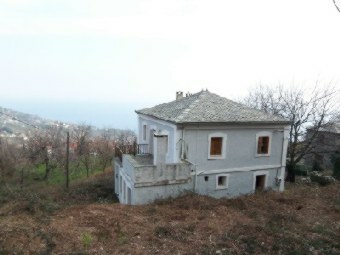 It is has two floors both with spectacular views of the sea and parts of the forest. 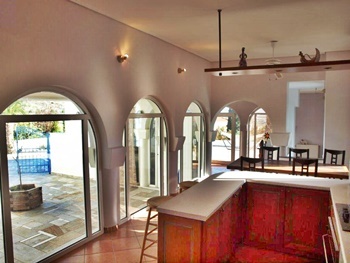 The lower level has large sitting, dinning and function rooms with fire place and open plan kitchen and also a small guest bathroom. 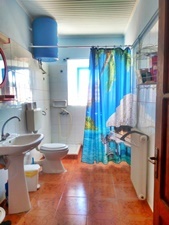 The top floor consists of 3 bedrooms and a large bathroom. 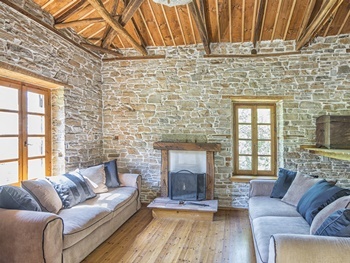 The stone annex which is attached to the house also enjoys panoramic views and consists of two floors with a bedroom, bathroom and living room. 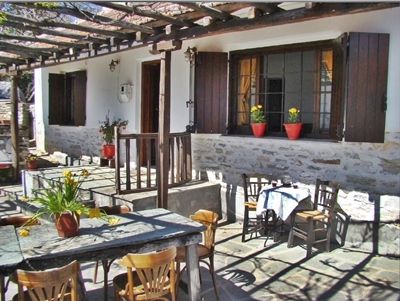 There are several verandas around the garden with traditional stone ovens, BBQ, terraces, flower and fruit gardens, storage spaces and etc. 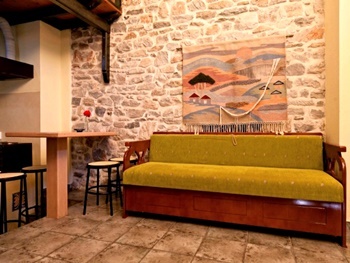 The stone houses were built in the 1950’s and have been beautifully renovated in 2003. 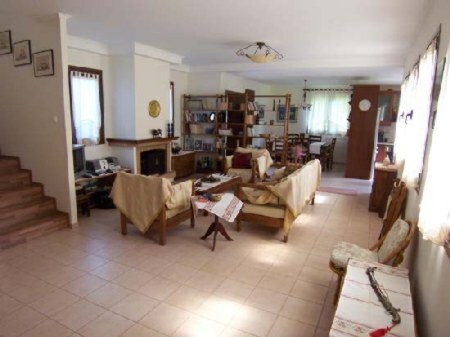 The total living space of the large house is about 160 m2 and the annex is about 25 m2. 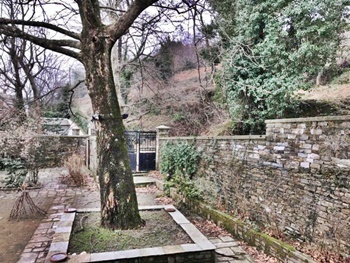 The estate does not have car access and is at the end of a cobbled path which is 330 meters from the central square and car park of Milies. 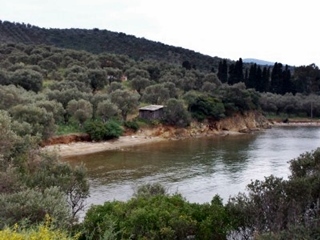 This is a 1930 square metres of olive oil trees with a small two floor house of about 65 m2 on one of Pelion's and perhaps Greece's most beautiful long beaches. 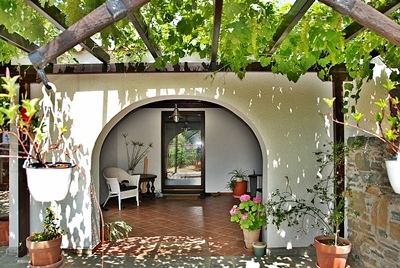 Tucked away in the corner of a long beach is this small house on an olive grove. 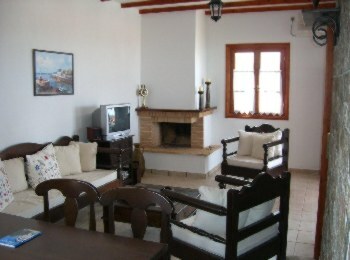 The spot is ideal, only about 50 meters from a sandy beach. 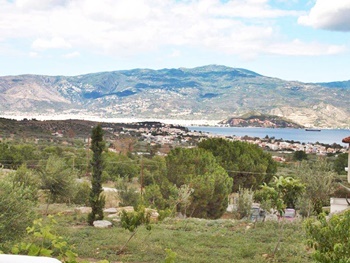 Since the majority of the olive grove is on a slope with wonderful panoramic views it falls within the village border there is a potential to build a large villa or a business establishment on the beach front property. 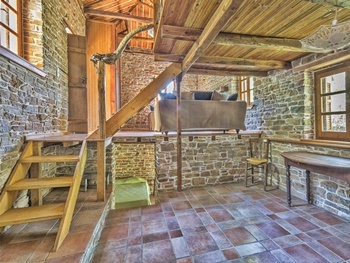 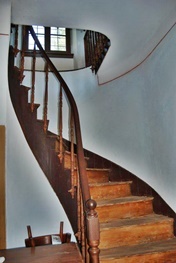 The house is on two levels. 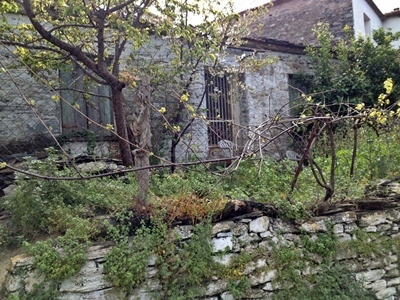 It is a simple, old, farm house. 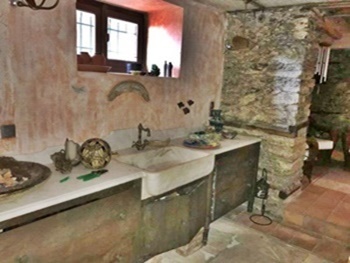 It has two small bedrooms with a corridor, a kitchen extension and bathroom. 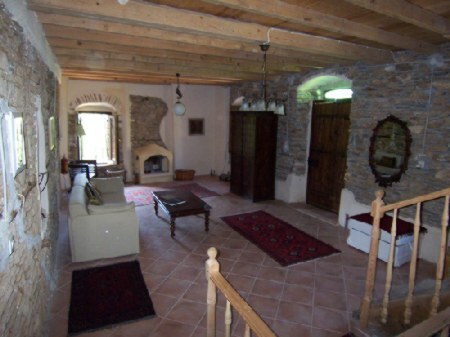 The ground floor is a large room of 30 m2. 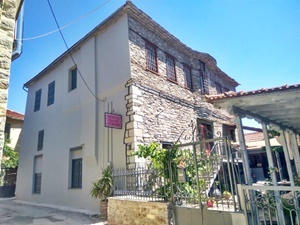 The spot deserves a much better looking building and it would not be surprising if the new owners, rather than renovating the old house just builds a new one. 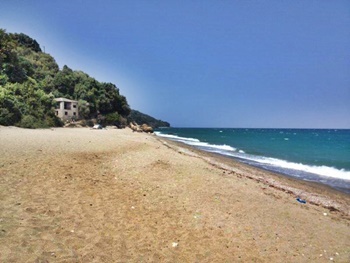 Horefto beach is one of Pelion's longest beaches and is situated on the Aegean coast of Pelion below the central village of Zagora. 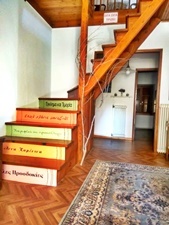 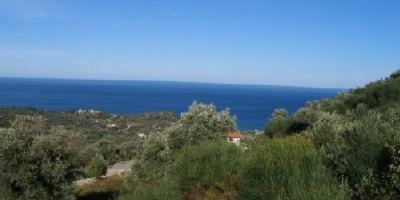 This two storey holiday home, is only 20m from the beach, and is for sale in Horto, South Pelion. 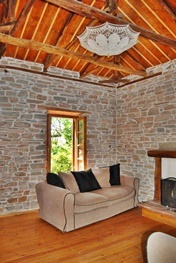 This old stone house has recently been restored and is fully habitable. 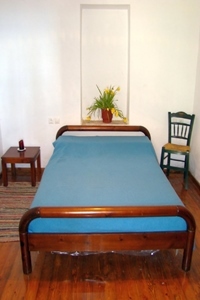 It consists of three independent and fully furnished studios. 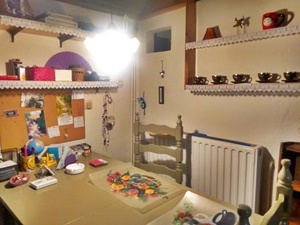 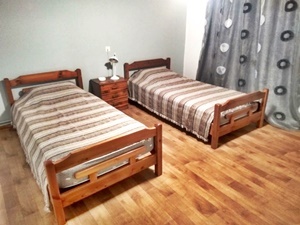 The fully furnished studios are on the ground floor and the first floor, and comprise of a living room with fireplace, an open plan kitchen, two bedrooms and one bathroom each. 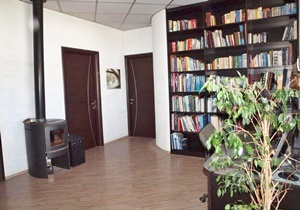 The studios are currently used as rental rooms and have an (EOT licence). 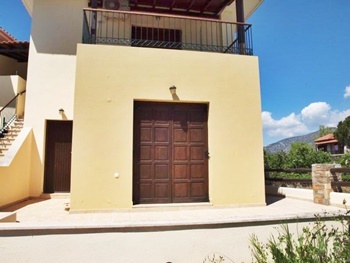 The property is located in an advantageous location due to its proximity to the sea, is car accessible and is for sale fully furnished. 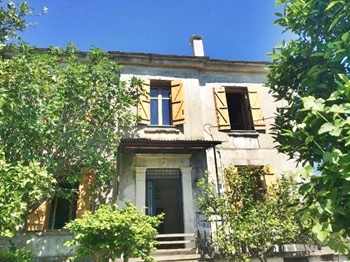 An independent level stone house with one bedroom, and space for extra bed in back room, living room and fireplace, open-plan kitchen, one bathroom, veranda and garden on 300 m2 of land with 75 m2 of living space. 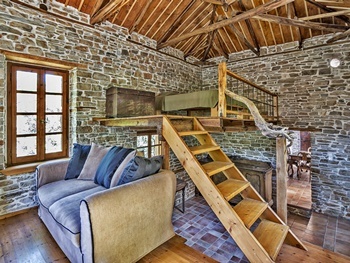 Recently reconstructed, the exposed beam roof further expands the feeling of the single story space. 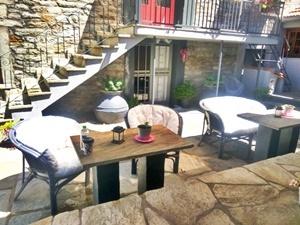 The vine-covered courtyard in front of the main entrance offers charming areas for dining outside during the warm summer months. 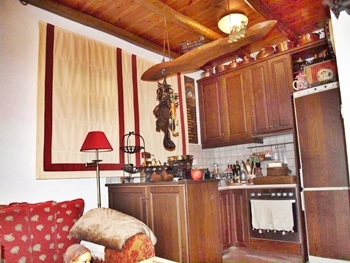 This comfortable home is conveniently situated in a quiet area of the traditional and popular mountain village of Vizitsa, whose picturesque main square and parking lot are only five walking minutes away. 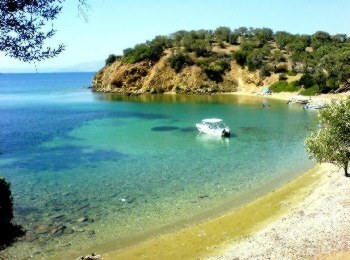 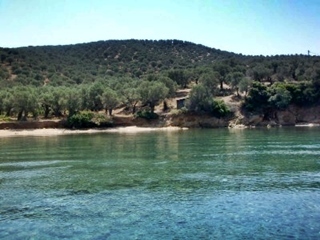 The nearest beach on the gulf side is a 10 km drive; the attractive Aegean beaches are just 20 km off. 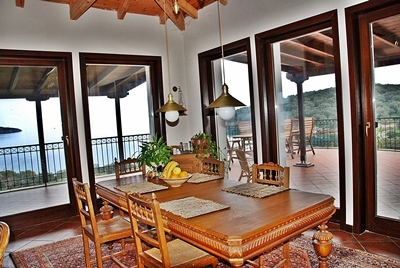 The property enjoys a wonderful view of the sea and surrounding mountains. 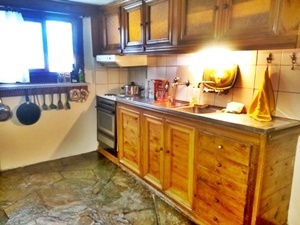 The cosy villa is for sale fully furnished, equipped with everything needed for immediate move-in, including central heating and A/C. 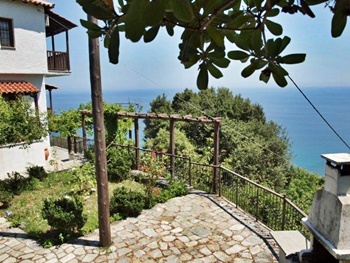 This is the most beautiful villa in the Pelion, situated on a peninsular, 30 metres from the sea on one side and 60 metres from the sea on the other side with a private sand beach. 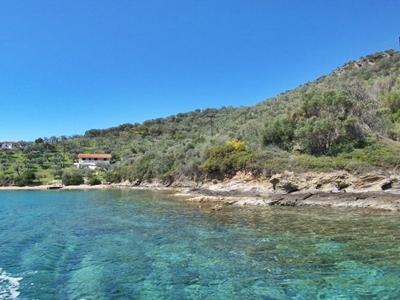 Prospective owners have the possibility to anchor their yacht in front of their home. 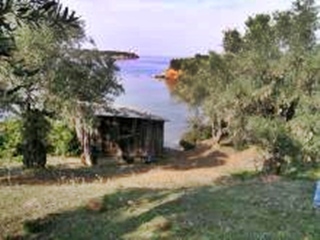 All rooms in the house have a sea view with the exception of one bathroom and the pantry. 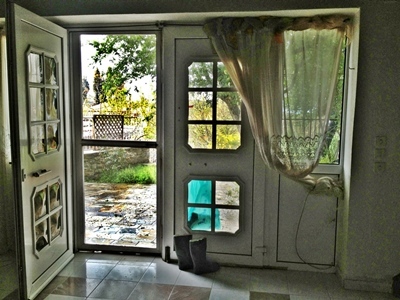 The entire house has radiant floor heating, triple glazed hardwood windows and doors. 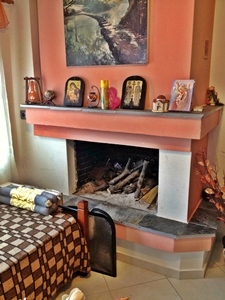 There is 10 cm of insulation on the outside of the house and roof, so the house is very warm in winter and cool in summer. 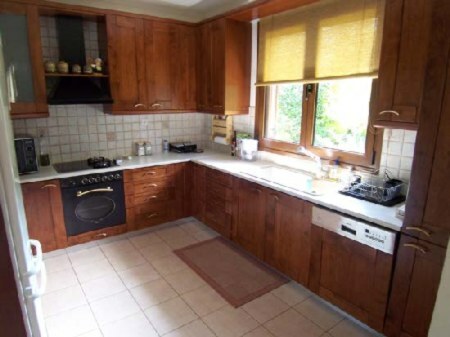 The kitchen has granite worktops and top quality appliances including an indoor grill. 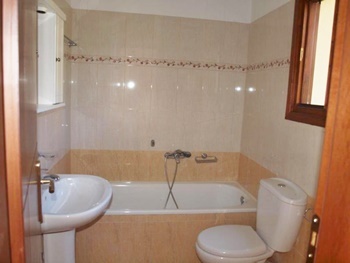 The master bedroom comes complete with jacuzzi ( sea view) and marble counters. 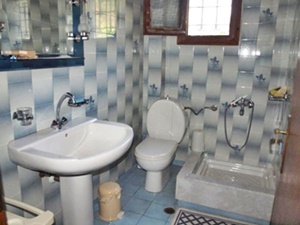 The villa was built in 2007 and has three bedrooms, 2 bathrooms one with Jacuzzi and walk in shower and one with walk in shower. 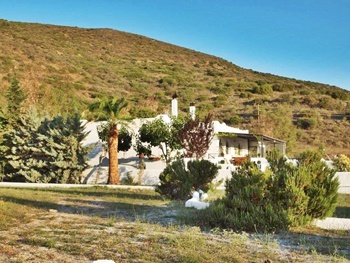 The gardens all have an irrigation system and contain many olive trees ,orange, lemon, grapefruit, peach, lime apricot and nectarine. 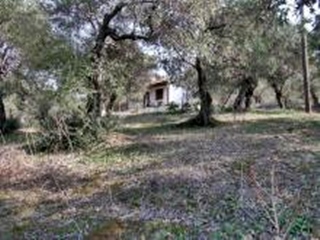 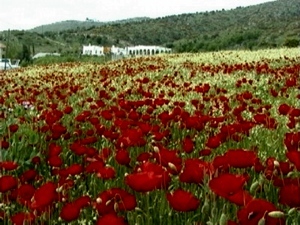 The plot size is 19,500 square metres of which 7,500 is olive grove. 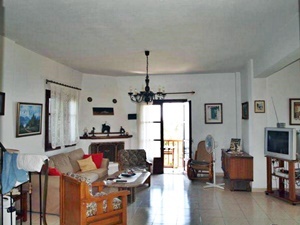 An older mansion house with 3 bedrooms with mountain & town view and an open plan cottage with 2 bedrooms. 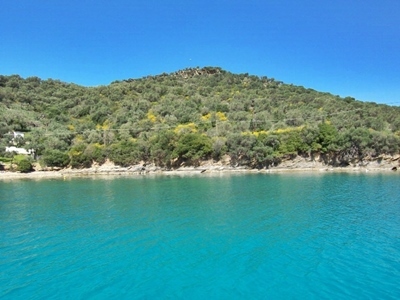 The Island is located inside a large sheltered Gulf which is a haven for many forms of wildlife and is perfect for sailing, fishing and snorkelling. 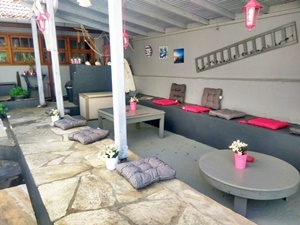 The Islands village of Agios Ioannis has a couple of tavernas, cafe, bar and a Mini Market with all that you need. 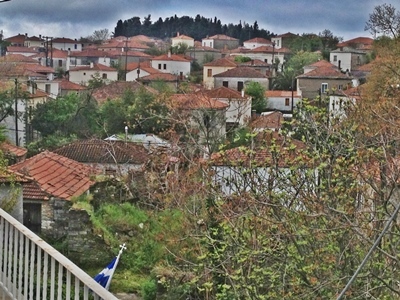 It is a rustic and simple village in a pretty place where the locals are incredibly hospitable and welcome newcomers. 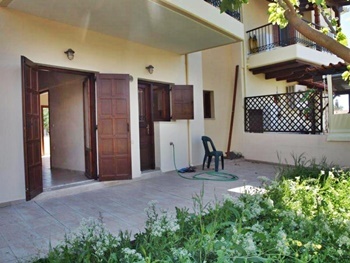 Each Villa has the following : 2 Bedrooms : Fireplace : Fully Fitted Kitchen With Tiled Worktops : Fully Tiled Bathrooms : Terrace With Excellent Sea Views : Storage Areas : Private Landscaped Gardens and access to a communal landscaped garden. 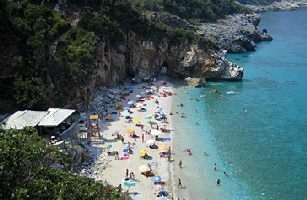 Around the Island are a plethora of sandy bays and coves dotted around the Island that provide good swimming, and all within walking distance. 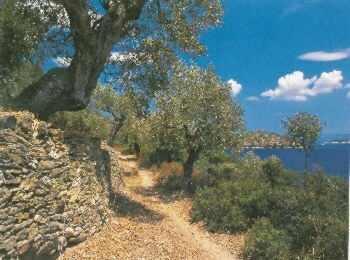 All the Villas are built in a 5200 square metre olive grove, only 100 metres from the beach of Saint Sophia. 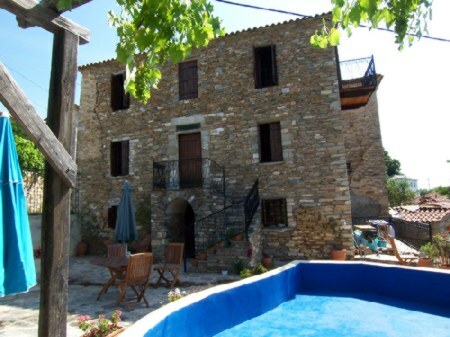 If You Would Like To Visit And View Or For Further Information Please E Mail Brian For PELION DK/TRIKERA E Mail Brian. 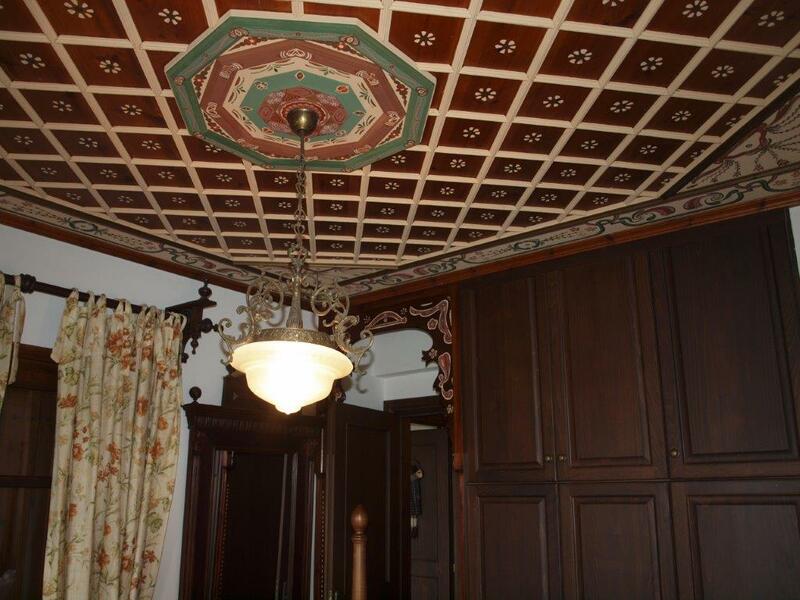 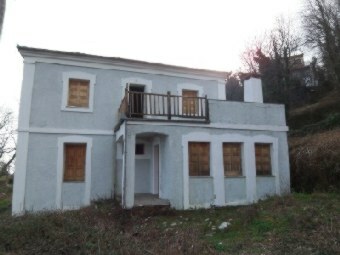 A special offer is available for property "B2" at the price of 83,000 Euros. 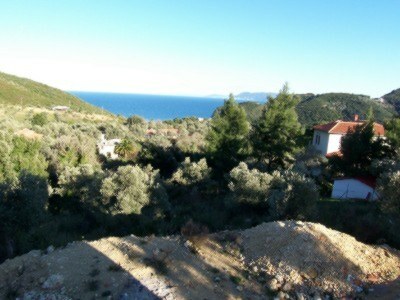 This Build-able plot of 2.500 m2 has uninterrupted Aegean views. 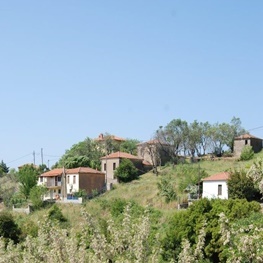 It is only 2,5 km from the traditional village of Xinovrissi, it has car access, is fenced, and has electricity and water supply. 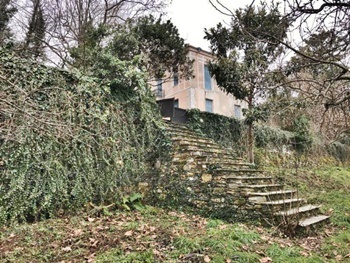 The plot building allowance for this half of the original plot is 100 m2 and is co-owned with the owner of the house next to it. 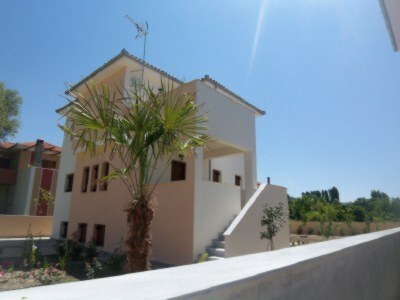 You will own the freehold. 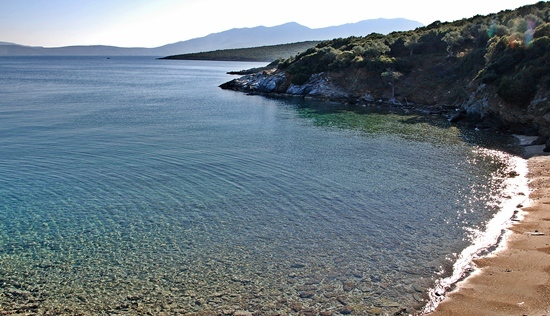 Xinourissi is only minutes from a spectacular beach. 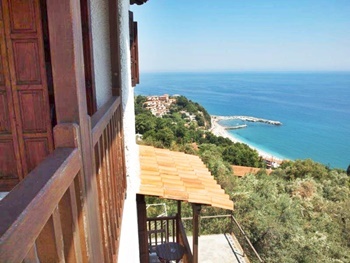 This is a convenient seaside villa consisting of two independent flats overlooking the calm Pagasitikos gulf of Pelion. 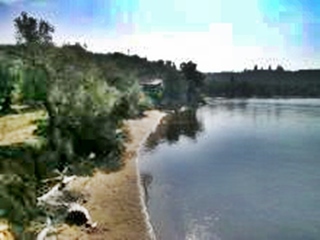 The views are open, uninterrupted and breathtaking. 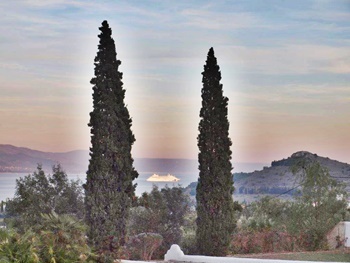 A romantic private rock plateau over the sea water awaits you by the sea only about 100 meters below the house through a mature olive grove which belongs to the property. 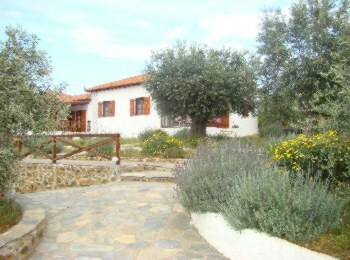 It is built on 4,200 m2 of gardens, olive groves and terraces. 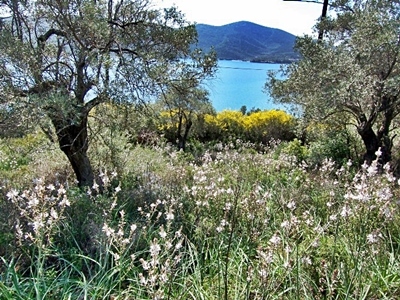 As is said above the views are open, uninterrupted and breathtaking. 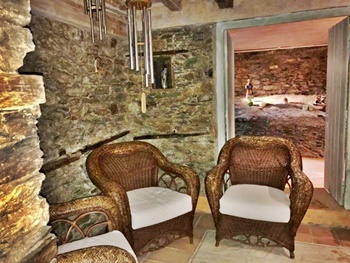 A romantic private rock plateau over the sea water awaits you by the sea only about 100 meters below the house through a mature olive grove which belongs to the property. 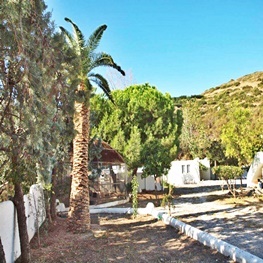 Further sandy beaches and catering facilities are in the village which is about 800 meters from the house. 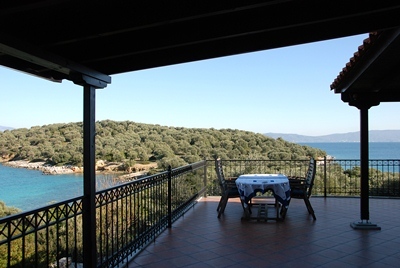 The villa enjoys a lovely breeze directly from the open sea on summer days and in the evening around the sun set the views become magical incorporating the sea, distant islands such as Euboea (Evia) and mount Pelion. 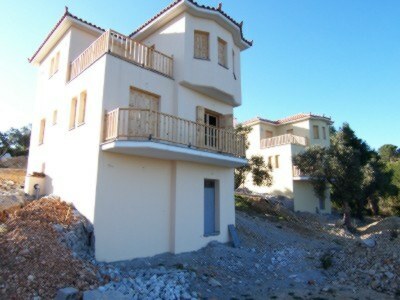 Two levels with 4 bedrooms, 2baths,2 kitchens on each floor sea side. 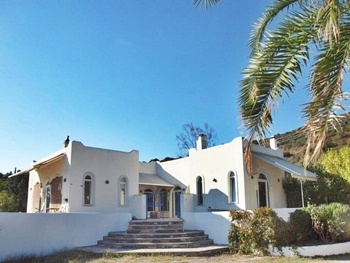 Villa/ private house sea side/water front : Land size 4,200 m2 Olive grove, fruit trees and floral gardens : Building size 180 m2 : Floor levels 2 : Total number of bedrooms 3, Two on top floor and one on first floor : Kitchens 2, one on each floor : Bathrooms 2, one on each floor : Verandas and terraces several : Views : Magnificent Pilion mountain, Evia island and the sea : Car access and parking Yes : Distance to nearest village 800 meters : International Airport of Central Greece about 20 Kilometers : Ideal for Boating and sailing, holiday home, water sports, tracking, gardening, fishing, romance and privacy. 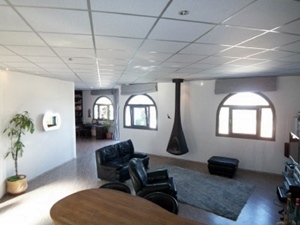 This is a very unique and practical house that gives you the feeling of a home from the very first look. 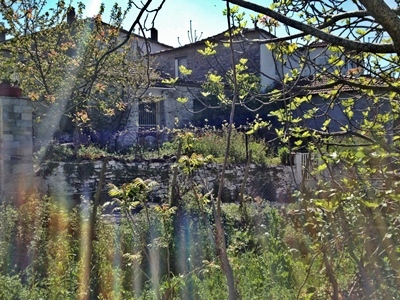 The home is about 70 meters from the parking lot through a foot path. 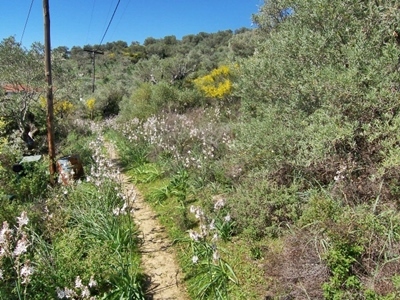 The flowers start from the first steps that contain between them a small and narrow water passage crating small waterfalls. 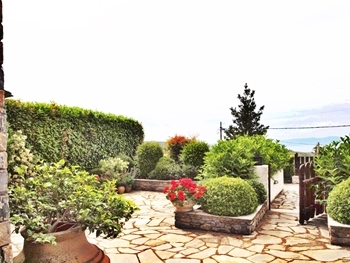 The garden is flat and full of flowers with views mentioned above. 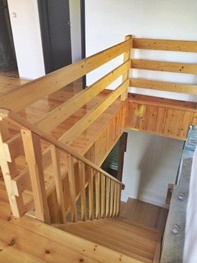 The house is on two floors with a bedroom and a bathroom on each floor. 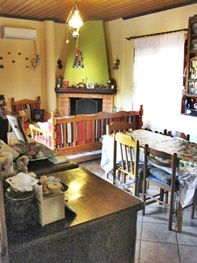 The dinning room and the open plan kitchen with fire place are on the ground floor. 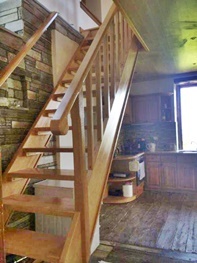 The top floor also has space on a wooden platform (mezzanine) built with sea reclaimed wood. 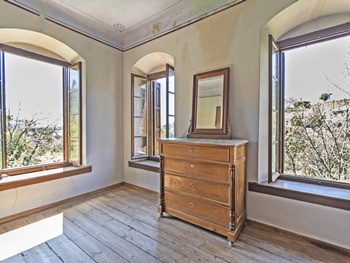 This area can be used as a bedroom with views or an office. 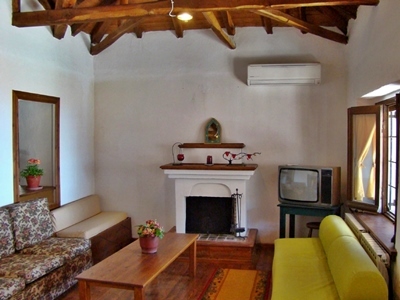 The house has air-conditioning, fire place, central heating and all utilities. 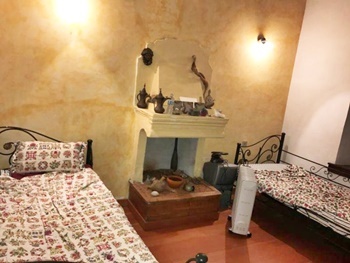 Two more bedrooms can be built on the second floor and another one could be converted from the spacey storage. 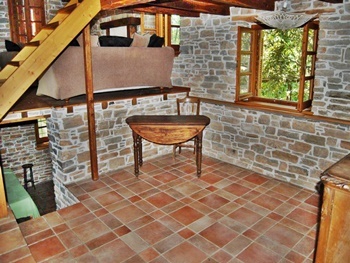 The house has a stone roof and is well insulated. 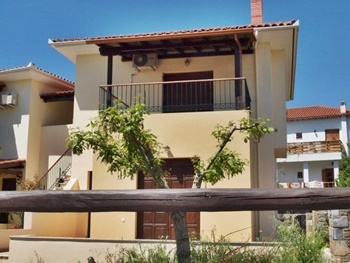 These modern new houses with a special Pelion appeal and stylish exterior and interior charm are conveniently located in a green and quiet area only 150 meters from the popular beach of Kala Nera. 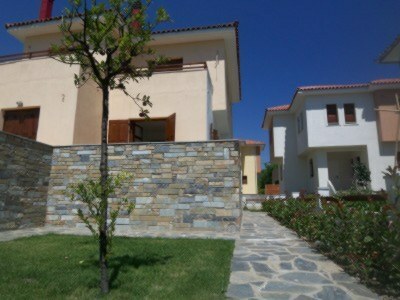 They are two story high consisting of two bedrooms, bathrooms and kitchen with a large semi basement. 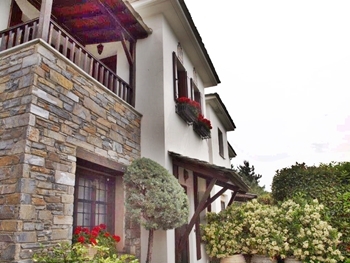 Each house has its own independent private entrance with a private garden of 1000 m2. 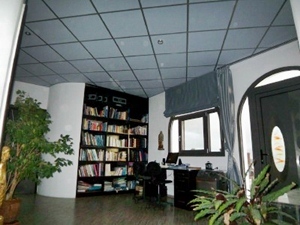 The houses are built by an owner architect and they are all anti-seismic. 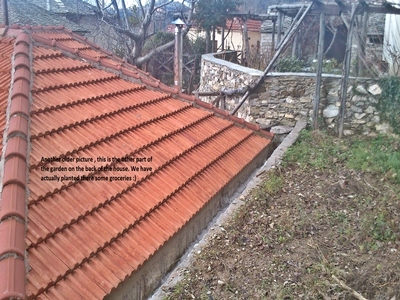 House sizes: House 1 and 2: 100m2 (50 on each level)+ 50m2 semi basement on 250m2 of walled private garden At 260,000-280,000 land. 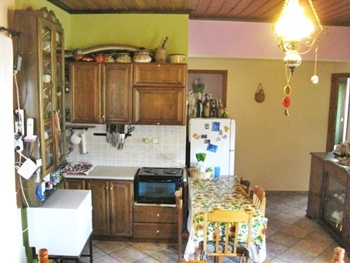 The price difference is due to position of the two houses. 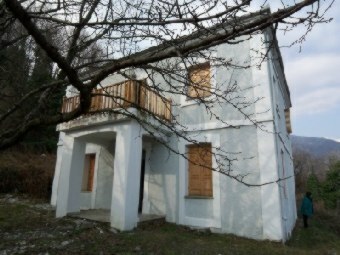 House 3_ Semi detached with private garden and entrance of 60 m2 (30m2 each floor) plus 30 meters semi basement, offered at 120,000 Euros. 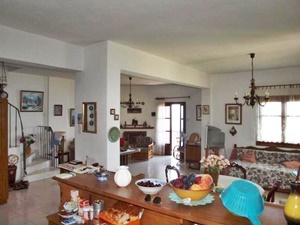 Minutes to the sea on 3 levels , 3 bedrooms, 2 bath, spacious semi basement to create more rooms with views, total of 2,000 m2 with 210 m2 living space. 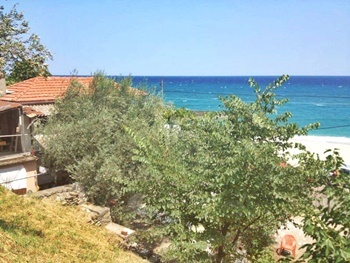 This property overlooks the costal line of Pelion on the Aegean and is situated above the popular sea resort village of Agios Ioannies with only minutes to the sea. 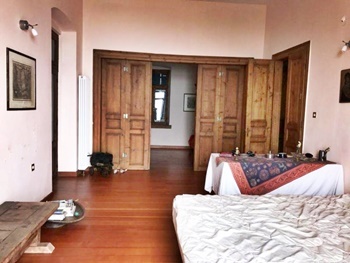 It is easily car accessed and has its own parking space the rooms are spacious and the ground floor with its large entrance hall and open plan kitchen and living room is very impressive. 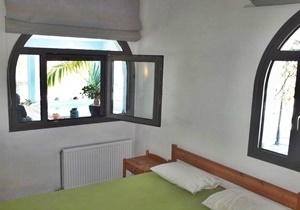 The bedrooms are on the second floor and a very large basement with sea view and facilities is ideal for storage or expansion. 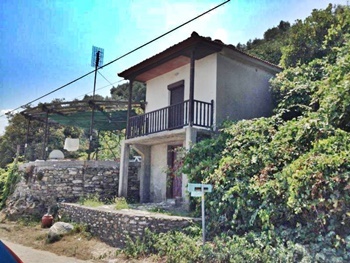 3 bedrooms, 3 bathrooms, 3 fire places, stone roof, newly built in the lovely green village of Mouresi in Eastern Pelion, only a few kilometers from some of Pelion’s and Greece’s best beaches. 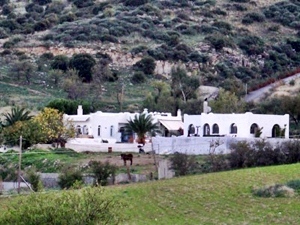 The mansion house is built on 658 m2 of land and is 193 m2 in area. 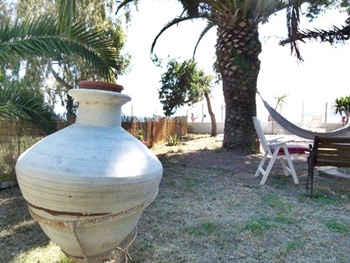 1st floor: 2 bedrooms, living room with views of the sea, open plan kitchen, two bathrooms one en suite, entrance hall and fire place, Balcony : 2nd floor: 2 bedrooms, large living room with sea view. 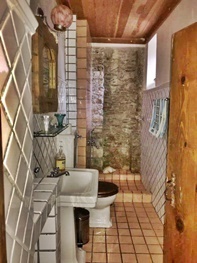 One bath room. 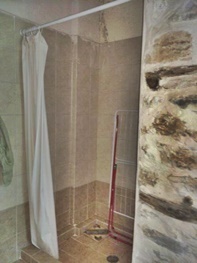 There is a basement with large storage areas, not finished. 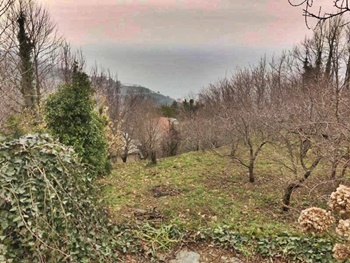 The garden is small but practical the house is car accessed and is to be sold furnished. 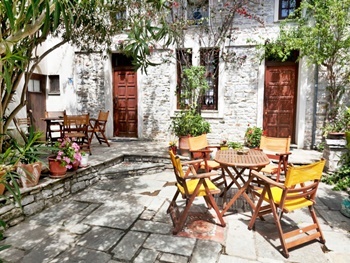 This village of Mouresi is one of the oldest in Pelion. 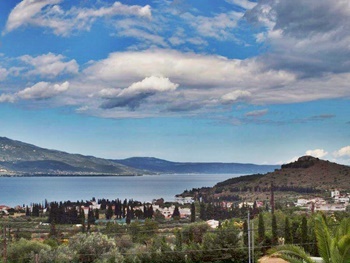 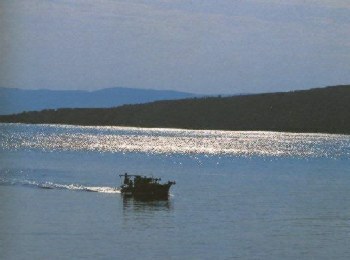 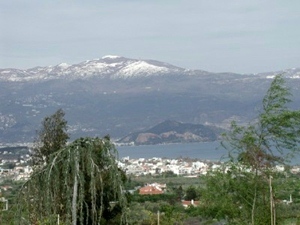 It is at an altitude of 370m and is 60km from Volos. 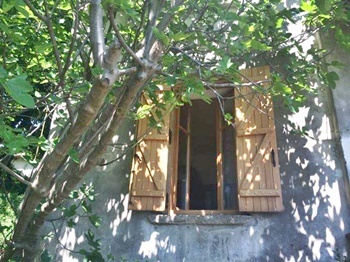 It was built on a hill surrounded by chestnut trees. 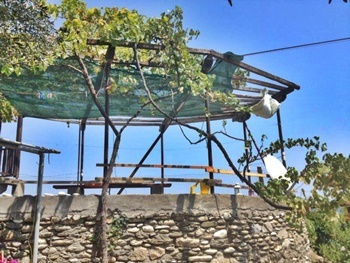 In the old days, Mouresi was situated in the place where the village of Damouhari lies today.The cobble-stoned square is just beautiful and is surrounded by large trees. 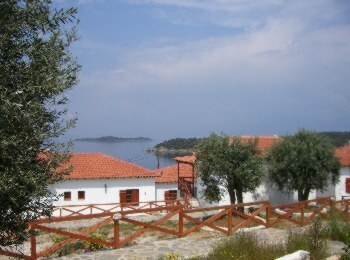 Located on the main square is the church of Agia Triatha. 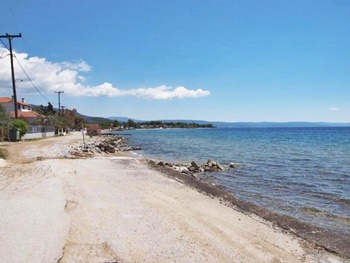 Platanidia is a small waterfront resort with long sands and gravel beaches. 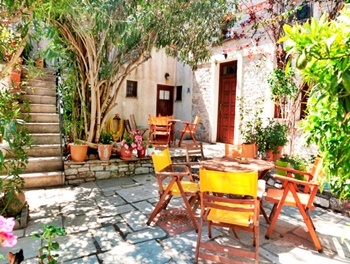 The flat is in a quiet village near the main road leading to Volos and Argalasti. 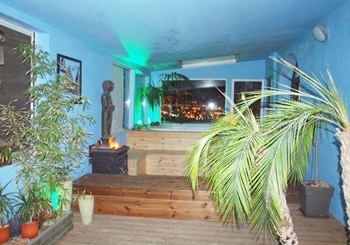 The flat is a brand new clean and practical flat with plenty of outdoor space. 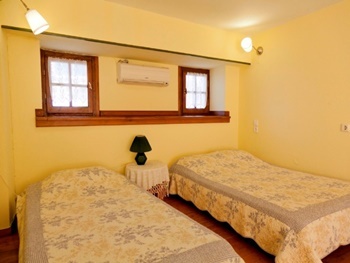 One bedroom is large with roomy closets and the second bedroom cozy and small. 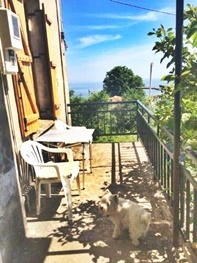 There is no sea view but the house is only 100 meters from the beach in a quiet neighborhood. 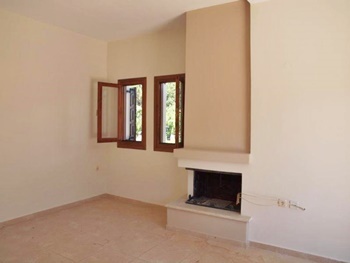 There are two bedrooms in this brand new flat, an open plan kitchen, a fire place, plumbing for central heating, 68m2 living space, a large terrace and two gardens with garage. 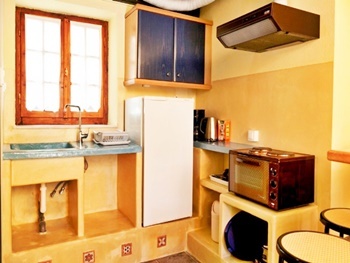 It is only 100 meters to water front catering facilities and beaches. 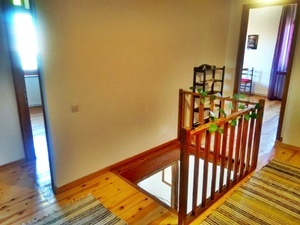 The flat and the gardens are independent and have their own entrance. 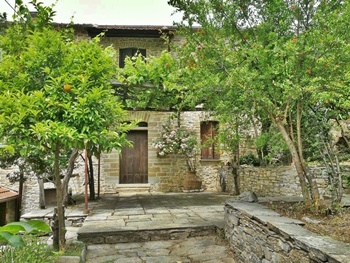 Beautifully stone finished house in the heart of Pelion mountain in the traditional village of Agios Yorgious. 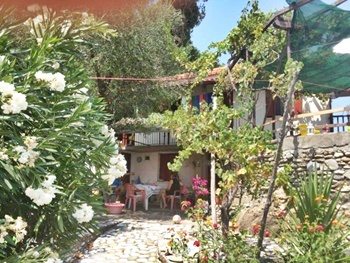 The house with good views of the gulf of Pelion enjoys wonderful sunsets through the year and is situated inside the village Within walking distance to the centre of the community. 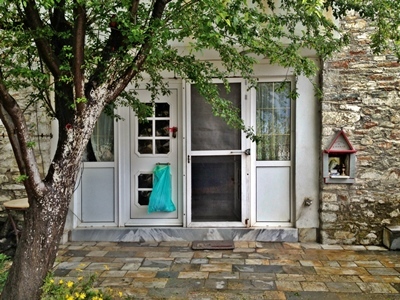 The property is Car accessible almost a rarity for Pelion village houses and has its own parking. 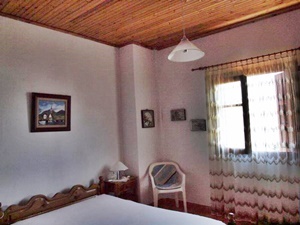 However, since the road does not continue any further after the property it guarantees the peace and quiet expected from a traditional mountain village. 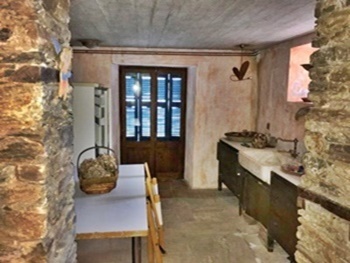 The small house is only completed as a foundation and a traditional stone roof but no work has been done in the interior leaving the new owner to indulge in their imagination. 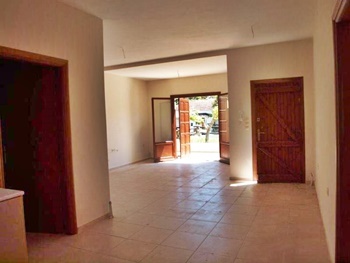 There are two floors to the house each at approximately 35 meters providing a space of approximately 70 m2 sufficient to build two small bedrooms, bath, living area and kitchen. 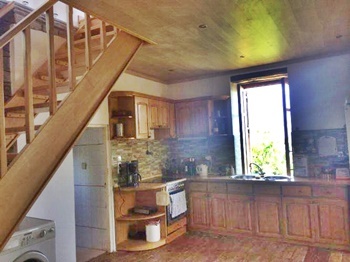 The house has the potential to build further living space if required. 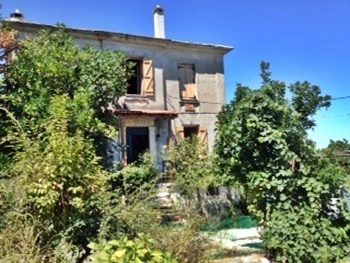 In addition to the parking there is also a small garden in the 280m2 plot on which the house is built. 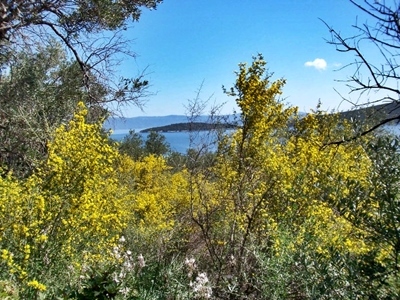 The area enjoys wonderful panoramic views and is ideal for mountain tracking and nature exploring. 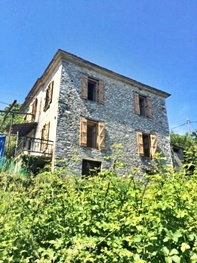 This traditional three storey stone house is located on the edge of Promiri, in South Pelion, overlooking forest and mountains. 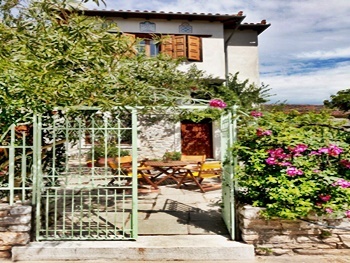 The property was built in 1887 and fully renovated in 2004, maintaining the traditional style while offering modern facilities. 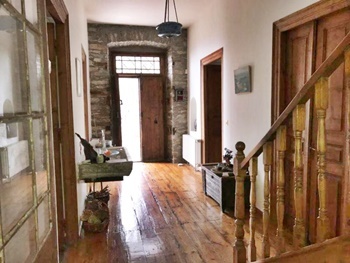 The total size of all three floors is 142 square mts. 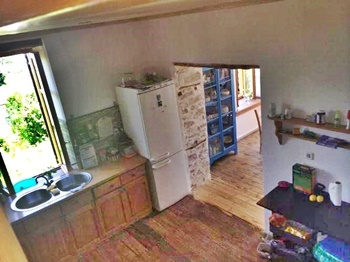 There is the open plan kitchen, a dining area and the bathroom on the ground floor. 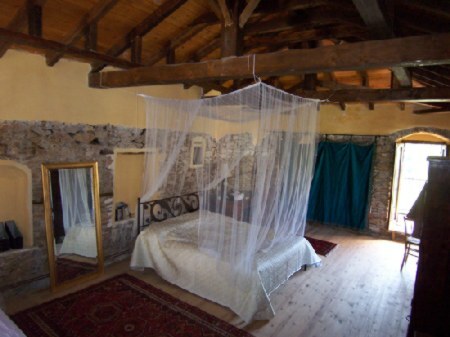 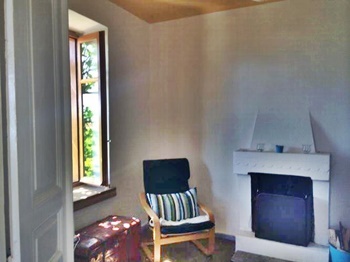 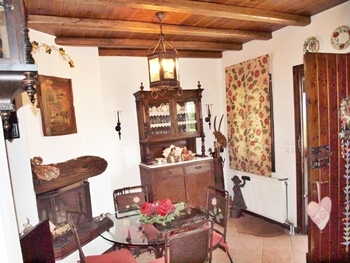 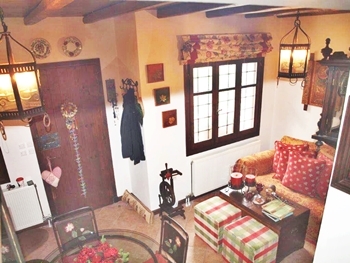 The middle level is a beautifully decorated room with a fireplace, used as a bedroom. 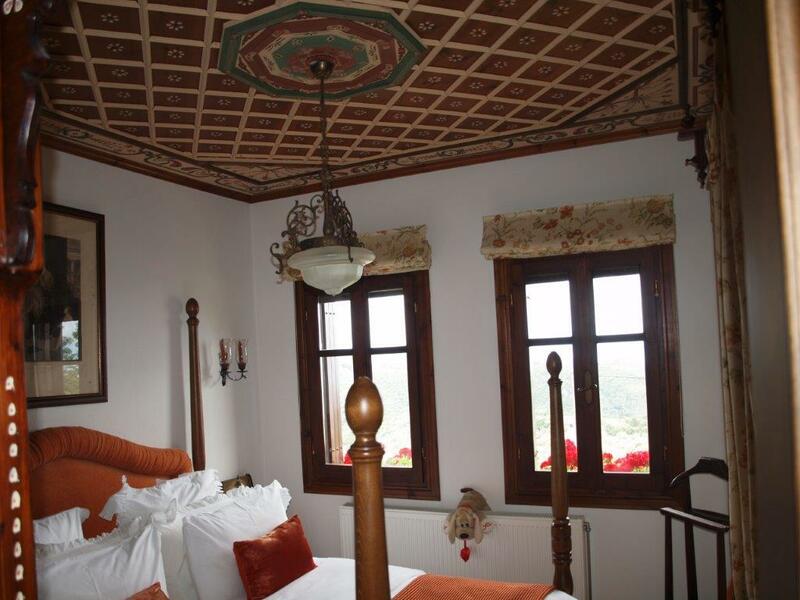 The top floor is again an open space with tasteful traditional touches and Beautiful views of the village and mountains. 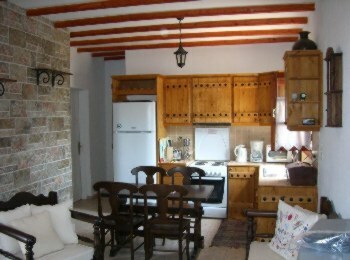 This traditional stone built property is For sale fully furnished. 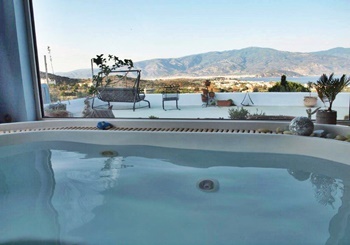 The traditional villa has a small swimming pool on the spacious courtyard. 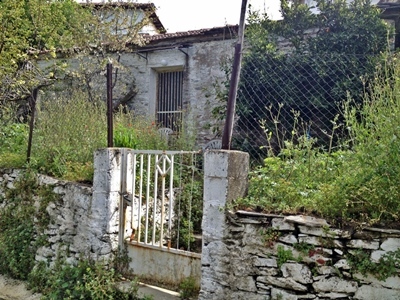 This charming property is car accessed. 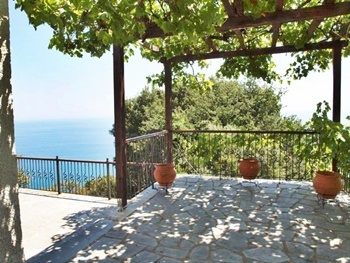 This unique 2-storey villa of 181m2, is only 100m from the beach and is located in Horto, one of the charming seafront villages of South Pelion. 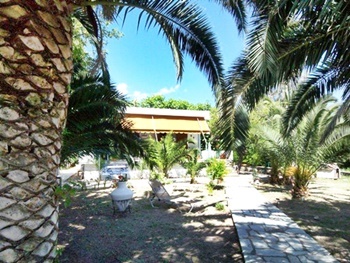 The villa is situated on a lush garden of 730m2. 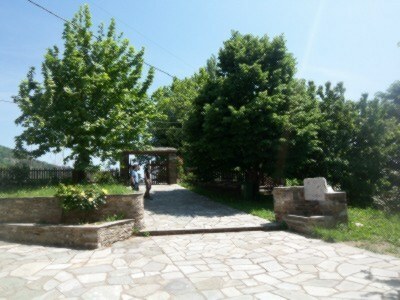 It has car access and a parking area for 3 cars. 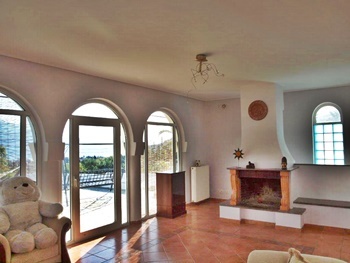 This spacious villa has an open, L-shaped living room with fire place, dinning area and kitchen. 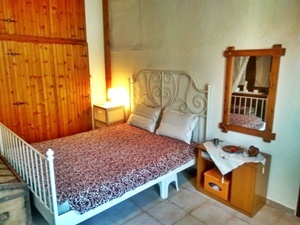 There is also an en suite guest room on the ground floor. 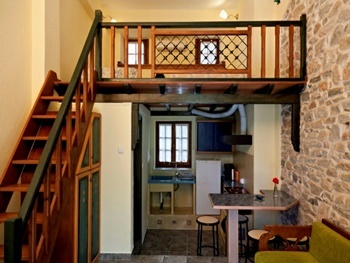 On the top floor are 3 bedrooms. 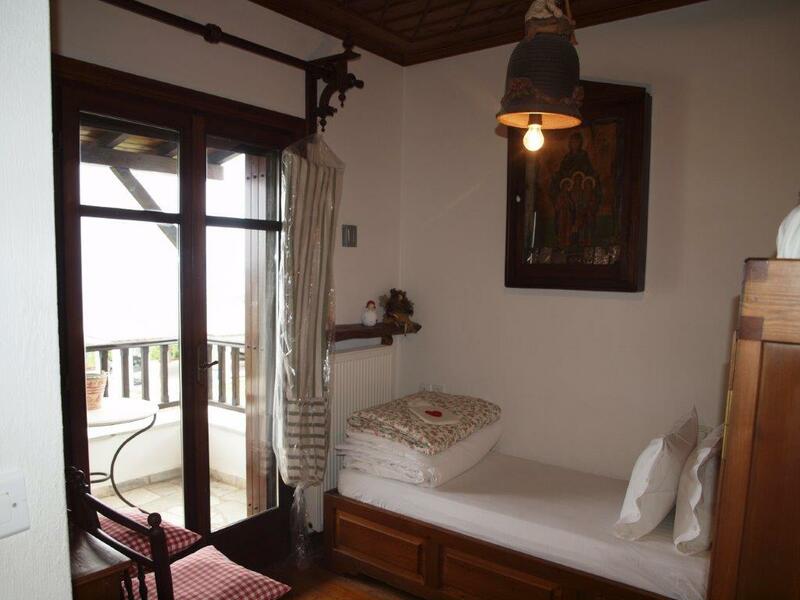 The master bedroom has a large veranda with mountain view and a WC. 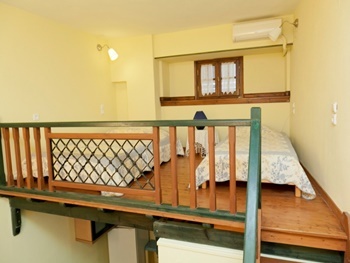 One of the other two bedrooms has a balcony. 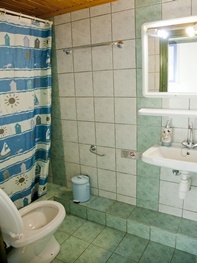 There is also a common bathroom for this level. 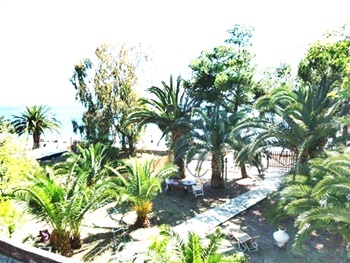 This holiday complex is situated near the Blue flag beach resort near to the port city of Volos. 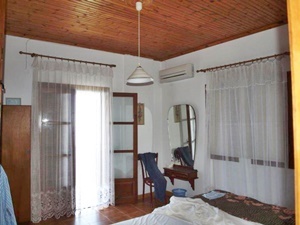 These are a total of 4 units in two villas and a guest house on a mature garden with all facilities. 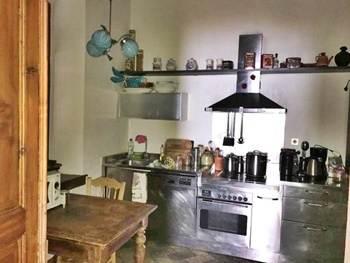 There is a potential of building a 5th unit. 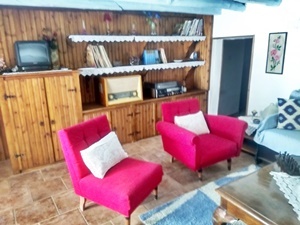 Garden facilities include Jacuzzi, carpeted basketball and game court, vineyard, fruit garden, sauna and a total of 500 m2 balconies with breathtaking views. 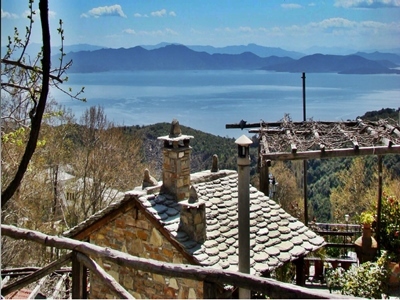 The villas are on a estate of 7000m2 with magnificent views of Mount Pelion , the port city of Volos and the Mediterranean. 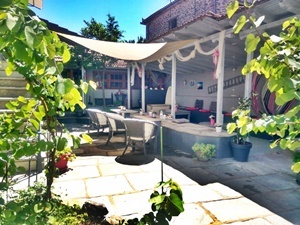 They are only 25 Kilometers from the international airport of central Greece and consist of a total of 9 bedrooms 8 bathrooms, living rooms, 3 kitchens, cinema room, fire places, game rooms, libraries, etc and have ideal holiday rental possibilities through the year. 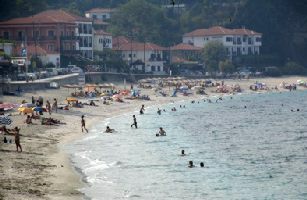 Other facilities in the area include winter ski centre on Mount Pelion, numerous archaeological sites, sea water sports, open horse riding fields, hiking and tennis courts. 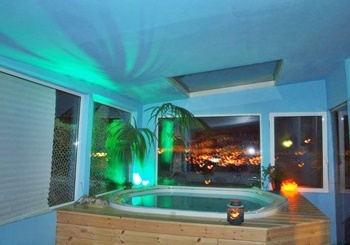 Now with infinity swimming pool. 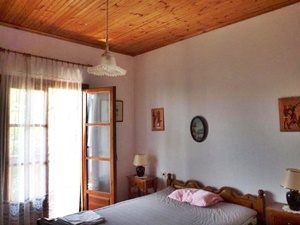 The properties are a five minute walk from the town square of Argalasti with all the usual shops, supermarkets, bakeries, cafeterias and tavernas. 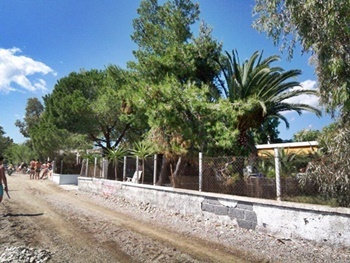 There is a roadway leading to them from either side and various parking places close by. 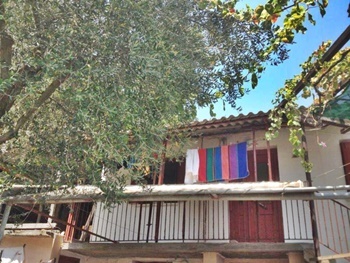 3 of the buildings are ready for moving in to and these have all sorts of possibilities ranging from private homes to renting out or making a few changes to create holiday homes/pension etc. 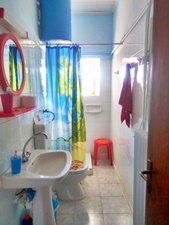 All properties have electric, water supply and a septic tank. 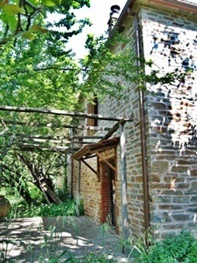 The properties consist of 4 buildings. 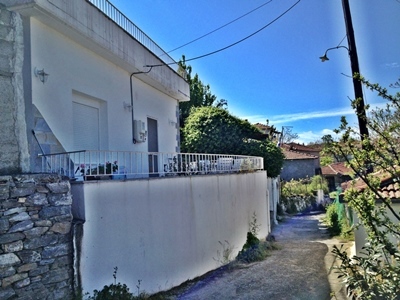 Facing the houses, the one to the right is an old 1960’s stone built house with two rooms either side of a hallway. 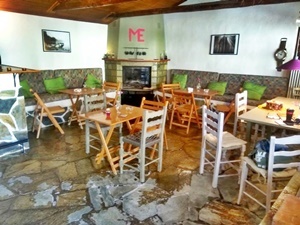 It is uninhabitable at the moment, i.e. 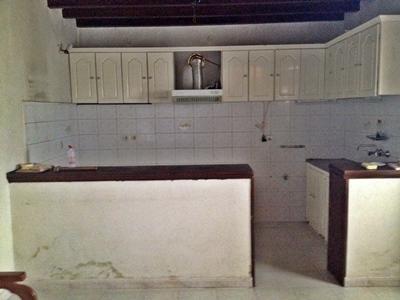 in need of complete renovation. 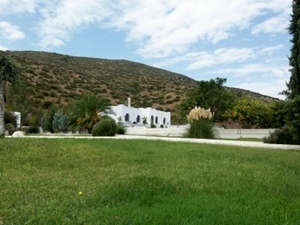 The house itself is approximately 50m2 and total land, including the house, is approximately 150m2. 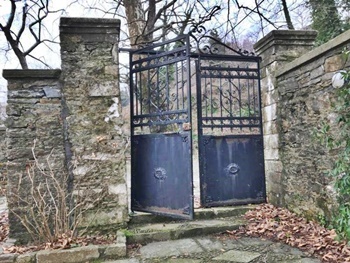 A gated entrance to the front garden, leads to the front door. 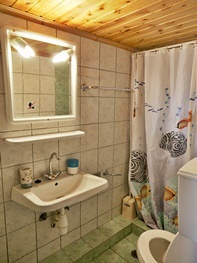 There is electricity and water supply and a septic tank. 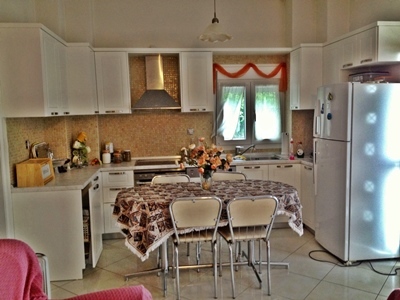 This house is fully furnished with all kitchen equipment, washing machine and freezer. 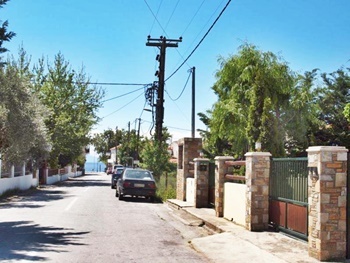 The second property to the left of the old house is a pair of stone built houses built in 1960’s, then in 1990 and 2000 they were reinforced by an extra 20cm inside walls and 20cm outside walls with iron rods and concrete, providing a 90cm thickness of walls. 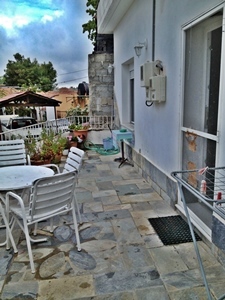 Around 50-60m2 each with a sea view to the front and a view to Agia Paraskevi to the left, the houses connect by a hallway upstairs. 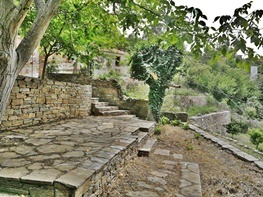 Stone steps lead up to the garden to the house on the right hand side, with a pretty garden and patio area, walkway around the garden with trees, shrubs and flowers and a pretty water feature with a mains tap. 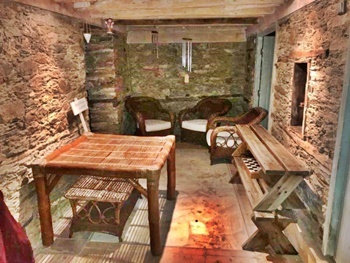 There is a large brick built barbecue and plenty of room for seating etc. 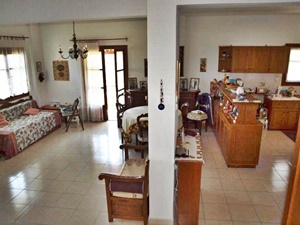 The entire plot with all four properties is approximately 150m2 and the owner wants to sell the whole lot for 525,000 Euros with the possibilities ranging from private homes to renting out or making a few changes to create a small holiday homes complex or pension etc. 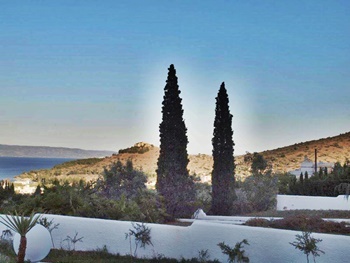 With breathtaking views is this wonderful garden right above perhaps one of Greece’s most beautiful beaches. 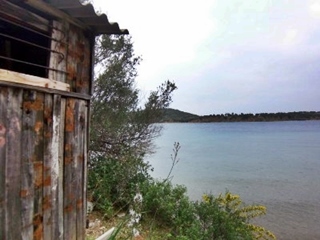 Although the wooden hut is in need of renovation and is built very basically with cheap material, it is fully legal and it can be either renovated with about 20,000 Euros or completely rebuild. 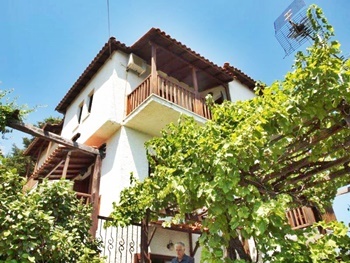 The property is within minutes’ walk to 3 wonderful villages of the Aegean Pelion and has all facilities including restaurants, café shops, bars, bakery, markets and more within walking distance. 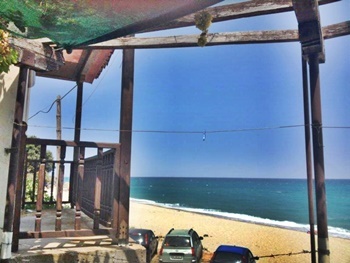 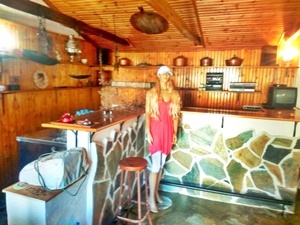 This is a small legal, registered wooden and cement blocks hut in one of Pelion’s most attractive sandy beaches, only 150 meters from the water front on 1,500 m2 olive grove, 8 minutes’ walk to Agios Ioannis popular beach resort/village, 8 minutes’ walk to Damouchari magical quaint fishing village. 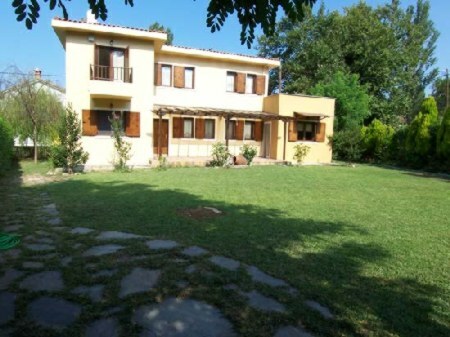 The villa is a total of 145 m2 with basement with the potential of a three more bedrooms flat. 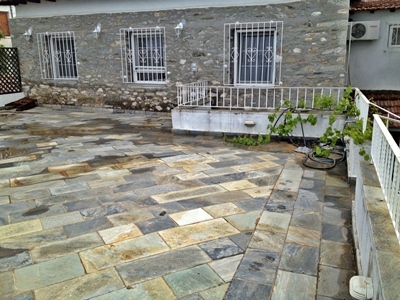 It is situated on a land of 4,750 m2. 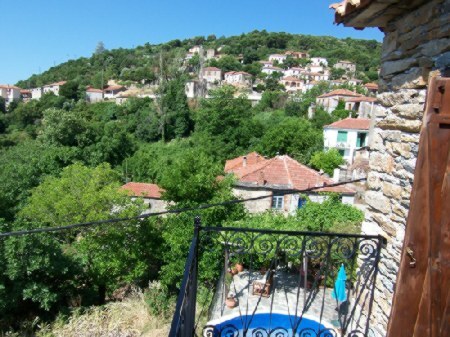 with magnificent views of Mount Pelion , the port city of Volos and the Mediterranean. 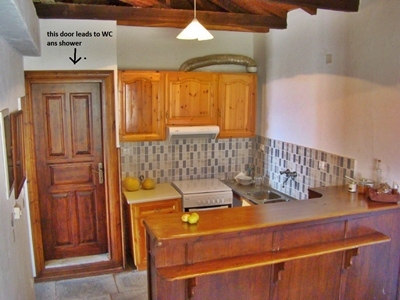 Facilities include Jacuzzi, wet sauna, dry sauna, hydro message, terraces, fireplaces, central heating, modern kitchen, library, additional bedrooms and storage. 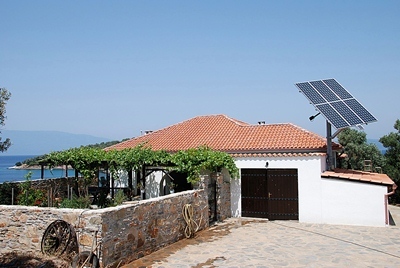 The villa is situated 25 Kilometers from the international airport of central Greece in Aghialos and only 8 kilometers from the port city of Volos. 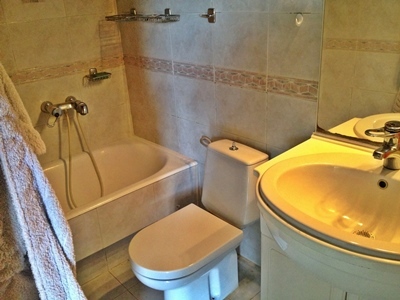 There is plenty of room and options for a swimming pool, game court and more. 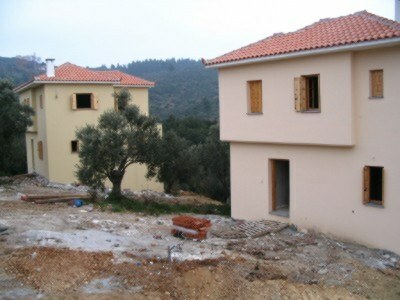 Currently the ground homes over 250 fruit and ornamental trees and a horse stable. 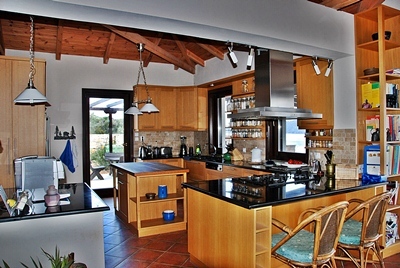 Ideal holiday rental possibilities through the year. 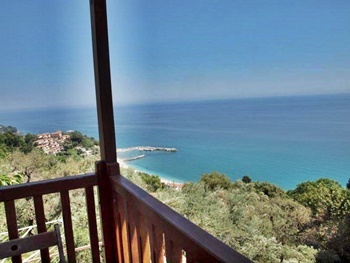 Other facilities in the area include winter ski centre on Mount Pelion, numerous archaeological sites, sea water sports, open horse riding fields, hiking and tennis courts. 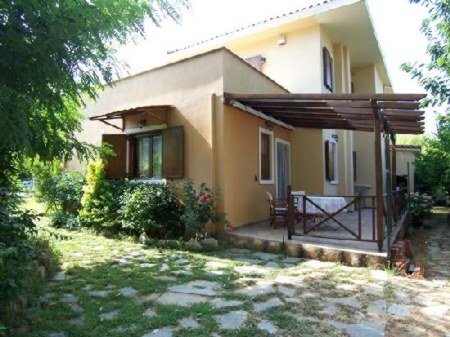 This is a 3 bedroom villa with open plan sitting, dinning, kitchen near blue flag beach resort and the quaint port city of Volos with, full spa, two bathroom, panoramic view terraces, mature garden and facilities. 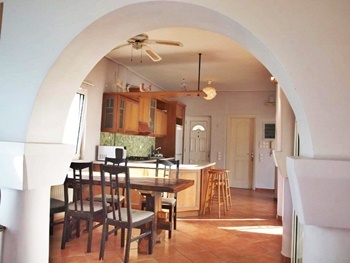 The two story and independent annex villas enjoy a panoramic infinity recreation pool and are very close to several blue flag beaches. 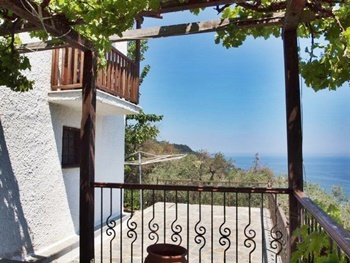 They have stunning views of Mount Pelion, the quaint port city of Volos and large parts of the Mediterranean Sea all the way to the island of Evia across the bay. 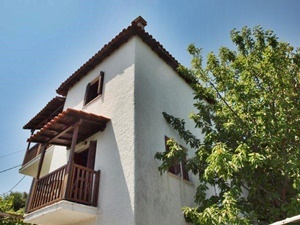 The villas provide a total of 300 m2 living space with an internal patio which form over 400 m2 verandas with breathtaking views around the house. 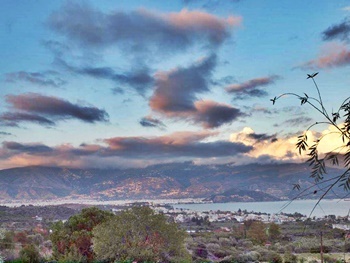 They are situated on 2,700 m2 of gardens, vineyard, rock and pond gardens, citrus trees and more with magnificent views of Mount Pelion , the port city of Volos and the Mediterranean. 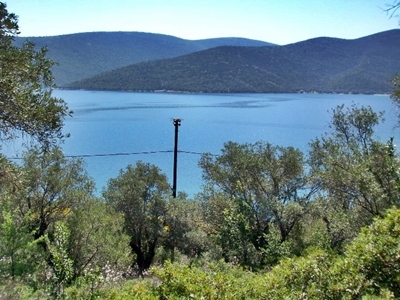 They are located 25 Kilometers from the international airport of central Greece in Aghialos and only 8 kilometers from the port city of Volos. 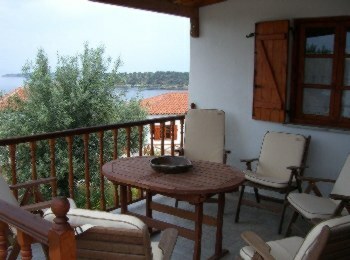 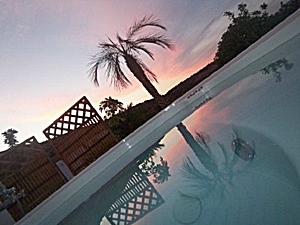 The villas provide ideal holiday rental possibilities through the year. 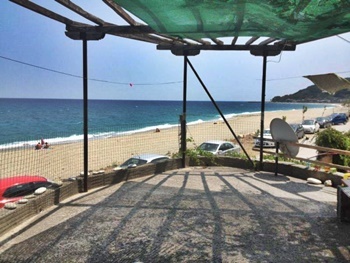 Other facilities in the area include winter ski center on Mount Pelion, numerous archeological sites, sea water sports, open horse riding fields, hiking and tennis courts. 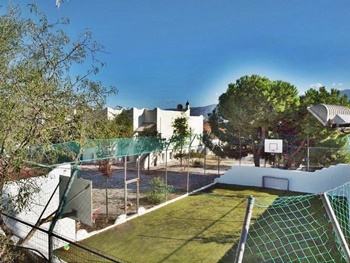 Guests of the villa have access to the outdoor sport area which has a carpeted sport court for basketball, football, badminton, gymnastics and other sports. 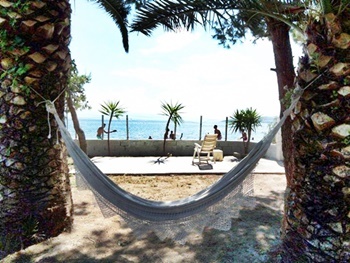 Total 5 bedrooms villas with open plan sitting, dinning, kitchen near blue flag beach resort and the quaint port city of Volos with yoga and function halls, 5 bathrooms, 400 m2 panoramic view terraces, mature garden and facilities on 4,300 m2. 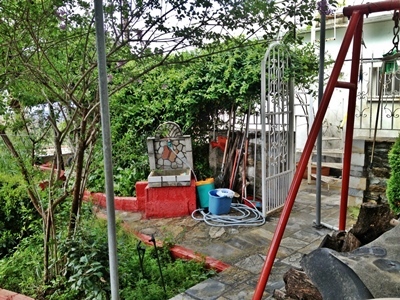 An independent annex with a bedroom, kitchenette and bathroom with independent access is situated at a corner of the garden.